The Chairman of The Church of Pentecost, Apostle Prof. Opoku Onyinah, on Wednesday, August 22, 2018 dedicated an ultramodern Children and Youth Resource Centre in the Teshie-Nungua Area. He was assisted by the Teshie-Nungua Area Head, Prophet James Osei Amaniampong, and the Resident Pastor of Graceland Pentecost International Worship Centre (PIWC) – Nungua, Pastor Ebenezer Agyapong. 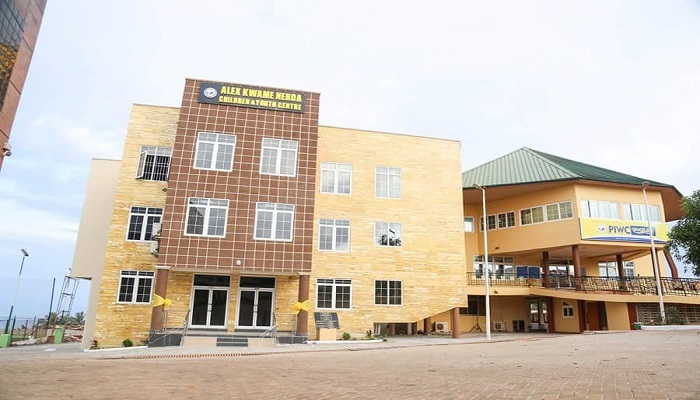 The Resource Centre was named after the late Elder Alex Kwame Nerda, a former Presiding Elder of the then Grace English Assembly now Graceland PIWC, Nungua. He passed on while serving as presiding elder. He contributed largely to the growth of the church. Apostle Professor Opoku Onyinah said the construction of the centre is part of the Church’s commitment to mentoring and equipping children and the youth who constitute about 72% of the total church membership. “This is in recognition of the role young people play in the church,” he added. The outgoing Chairman advised parents to be careful how they handle little children in the church. “Their actions may be seen or interpreted as distraction. Allow them. They learn as they make noise. I don’t see their noises as a distraction,” he reiterated. He expressed his sincere appreciation to the Area leadership for implementing decisions by the General Council concerning children and young people in the Church, and encouraged other Areas to emulate same. Apostle Prof. Opoku Onyinah also expressed his profound appreciation to Elder Dr. Joseph Siaw Agyepong (CEO of Jospong Group of Companies) and his wife, Deaconess Cynthia Agyepong for their unstinting support for the Lord’s work at all levels. Delivering the sermon on the theme, “The Pencil and the Master,” the Children’s Ministry Director of The Church of Pentecost, Apostle Fred Tiakor, read from Jeremiah chapter 18 and Philippians 4:13, and explained that human beings are limited in strength, and as such, they are unable to achieve all that they plan to achieve in life. “But if God gives them the strength, they can do all thing,” he said. Apostle Tiakor said that God expects all believers to be fruitful and be people of excellence. In view of this, he said, God is able to use children and the youth to achieve great accomplishments because Christ lives in them. He said that just as pencil remains in the hands of the user and its use is determined by the user, so it is expected of all believers to remain in Christ and give themselves wholly to Him so He can use them for whatsoever He intends to use them for. Apostle Tiakor observed that human beings are fallible and are capable of making mistakes. He also quoting Proverbs 22:6 and encouraged church leaders to teach children and the youth the way they should go, and correct them in love when they commit mistakes. “What is within is the most important, hence encouraged all believers to remain in Christ and keep on keeping on no matter what the situation may be, without giving up,” he said. He therefore entreated parents and church leaders to help raise dedicated, Spirit-filled and responsible children and youth for the Lord’s work. Present at the ceremony were Apostle Rigwell Ato Addison (former General Secretary of the Church and Area Head for Teshie-Nungua), Apostle David Nyansah Hayfron (Youth Ministry Director), and the Area pastorate. Also present were the chiefs of the area. Report by Erick Makafui Boatri.